Almost twice the torque* means fastest grinding. TORMEK is a dramatic improvement in edge tool sharpening. You can sharpen & hone an edge with an accuracy previously impossible - much more easily. 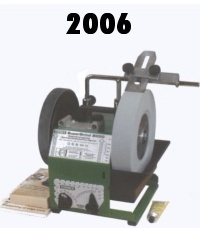 You can shape the tool exactly to your needs and previous sharpening is replicated in less than 60 secconds. Plane Irons to complicated shapes such as fingernail turning gouges, are easily sharpened. 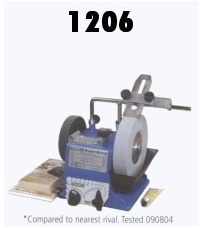 The water cooled grindstone ensures that the edge does not overheat & loose hardness. Finish the sharpening process on the leather honing wheel which lets you polish the edge to razor sharpness without bench stones. SVS-50 Multi Jig Carving & turning skew chisels incl radiused & parting/beading tools & roughing gouges.